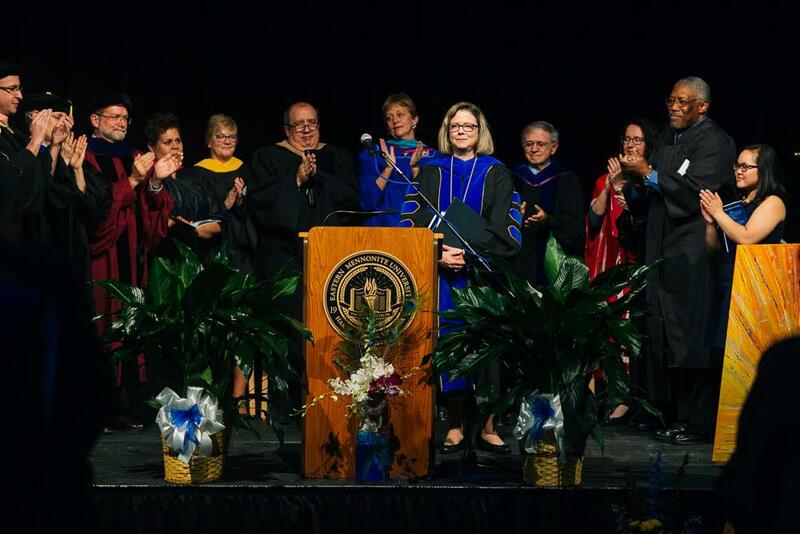 Some 500 voices joined in the litany of investiture today to welcome and bless Eastern Mennonite University’s ninth president, Dr. Susan Schultz Huxman, during the inaugural ceremony at Yoder Arena. It was indeed: Acknowledging EMU’s 100-year-history, its growth as a diverse, Christ-centered community, and its historic commitment to nonviolence and peace, the litany, written by Professor Vi Dutcher, blended voices of EMU’s students, faculty and staff, and the board of trustees, as well the broader community, including representatives from Mennonite Education Agency and Mennonite Church, USA, into an encouraging message of legacy, faith and Christian community. 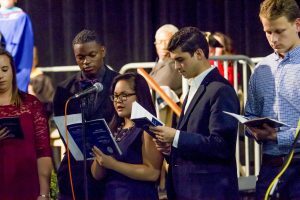 Watch a livestream video of the inauguration ceremony. Present for the ceremony were 17 delegate representatives from colleges and universities, including Mennonite institutions. In her address titled “Behold and Enter the Countercultural Story,” Huxman pointed to two such “Behold!” moments and the trajectories that followed. The first was the “leap of faith” taken by church leaders to open Eastern Mennonite School in 1917 with 20 students and four faculty members in the Shenandoah Valley. Now the institution includes nearly 2,000 students, two additional instructional sites, more than 100 faculty and 60 academic programs. At EMU, she noted, students experience a life-changing visible academic and invisible communal curriculum and are immersed in a series of “eyes-wide-open” moments that lead to life-changing and “counter-cultural” transformation. “I love to tell our unfolding, unconventional story in harmony with the ‘old, old story of Jesus and his love,’” she concluded. As the first woman invested as president, Huxman has already contributed this countercultural theme. 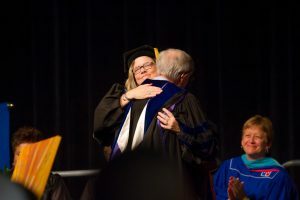 She was previously president at Conrad Grebel University College, Waterloo, Canada, and prior to that, director of the Elliott School of Communication at Wichita State University, Kansas. 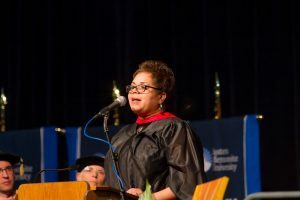 Dr. Wendy L. Fletcher, president and vice-chancellor of Renison University in Ontario, Canada, affirmed the selection of Huxman to lead EMU in a tumultuous and dangerous time as the tenets of the faith call for radical action and a powerful voice. Inauguration festivities continue with a student-planned gala evening event tonight.